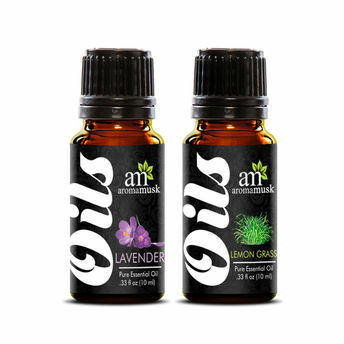 AromaMusk's LemonGrass Oil has a blend of lemony and earthy aroma which refreshes your mood. Lemongrass essential oil is used in aromatherapy and known for a variety of health benefits. The 100% pure and natural lemongrass essential oil is extracted by steam distillation from the fresh leaves. Its lemony and earthy aroma helps relieve stress and anxiety. Just add few drops of Lemongrass essential oil in your aroma diffuser or ultrasonic humidifier to keep your interiors smelling fresh. AromaMusk's LemonGrass oil can be added to your bath or shower to relieve stress. It can be massaged on your skin as an aromatherapy massage oil. But Make sure to dilute it with a carrier oil. It can also be added to your hand or foot soak. Add a drop to a bowl of warm water before soaking your hands or feet.